Come and scream for your team – as improv legends battle it out to win the coveted WA Theatresports™ Championship Cup at the picturesque Mount Lawley Bowling Club. 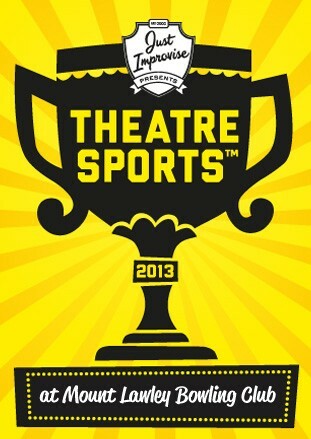 Theatresports™, created by the legendary Keith Johnstone, is the original improvisation competition. It throws performers, comedians and game punters quick challenges, requiring teams to think fast and act ever faster as they perform scenes and scenarios inspired by audience suggestions. Directed by National Theatresports Champion and Just Improvise’s Creative Director Glenn Hall, and featuring the toe-tapping tunes of live house band the Cross Eyed Cats, Theatresports™ 2013 is improvised theatre the whole family will love! Roll up from 4.00pm for a bowl and a sausage sizzle before the show. Theatresports™ is extremely popular and shows sell out. Pre-booking is strongly advised to avoid disappointment at the door.